A TB-303 and then some. If that's what you want, get it. Decent 303 clone. Interesting new bells and whistles. Good price. 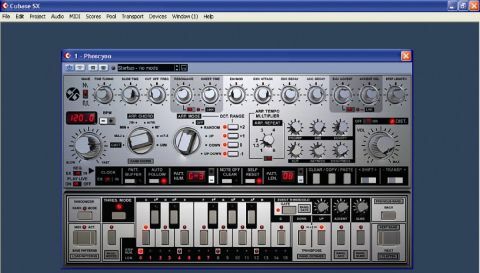 Fans of the Roland TB-303's distinctive tones are spoilt for choice on the software emulation front. One can acquire the original ReBirth 338 for free via its sinister online mausoleum, and there are dozens of other versions available, including Audiorealism's elaborate mutation, Bass Line Pro. Despite the crowded market, Polish newcomers D16 Group have seen fit to debut with Phoscyon, a curiously named TB-303 clone with a few tricks up its sleeve. Though Phoscyon might not be a fantastically original idea, it does manage to pull a few surprises out of the bag. The most obvious, yet least consequential of these is the rather striking interface design. The photorealistic look works well and certainly sets it apart from the competition visually. Despite the large number of new knobs and switches the interface is pretty clear, and everything is logically laid out. Anyone who's used ReBirth, or indeed a real TB-303, will feel right at home, although those unfamiliar with the intricacies of its step sequencer might feel a little lost at first. Unfortunately Phoscyon's manual is rather poorly written, though it does at least feature a short but informative quick start section. Despite the manual's shortcomings, this kind of thing isn't exactly rocket science and it's not too hard to get the synth making some nice noises. Much of the 303's individual style comes from its built-in 16-measure step sequencer. Phoscyon has its own step sequencer that has the same features, including some clever new tricks (including a row of LEDs across the bottom of the sequencer's interface that indicate what measure is currently being edited). This is much clearer than the usual digital display, and as such it's a welcome addition. Other new sequencer features include the ability to pitch notes up two octaves instead of just the usual one, and the rather mysterious Threshold control. The manual is a little confusing on this function, but it's actually a type of filter used for bypassing accent, glide and gate values. Not particularly exciting, but potentially useful for live work. The patterns from the built-in step sequencer can be triggered in from the host sequencer via MIDI notes. The triggering mechanism can be configured to work in a variety of ways, depending on how the Note Off Clear and Self Reset switch are arranged. Again these are non-essential functions when you're using Phoscyon with a sequencer, but they make jamming new parts easy and are ideal for the live performer. As well the internal sequencer, Phoscyon allows users to enter notes via MIDI from the host program, which is well done. Notes are accented by giving them a velocity over 100, and starting a new note before the last one has finished will cause Phoscyon to slide between the two values. The system works well and is better at incorporating the synth into song-based tracks than the internal sequencer. So Phoscyon is pretty flexible on the sequencing front, but it's the sound of the synth that'll sell it. Most 303 clones have a hard time with synth purists who are never quite satisfied with the quality of software copies, and it's unlikely that this attempt will convert them. However, if you're not intimately familiar with the original hardware it's most likely that you'll find Phoscyon convincing enough. It remains pretty true to the original hardware; you're limited to square or saw waves, and there's a single filter with the 303's characteristic 18dB low-pass response. There are plenty of new knobs to go round though, including envelope attack time, slide time, envelope accent level, and accent attack and decay times. These all work as you'd imagine, and techno-heads will appreciate the extra noodling possibilities, though there's nothing spectacularly unexpected on offer. The final two additions to the classic 303 line-up are the built-in arpeggiator and distortion units. The distortion unit has six knobs and getting a decent sound requires more tweaking than ReBirth's equivalent, but the extra controls make it more flexible and a variety of suitably crunchy noises can be gleaned from it. The arpeggiator is fairly sophisticated, and offers a selection of patterns, tempos and chords, including some user-defined ones. There's also a repeat note mode that repeats each note of the sequence a certain number of times, and an octave selector that lets you turn up to four octaves on or off - a nice touch. The good news is that it works really well and integrates especially well with the external sequencer. While this synth is by no means groundbreaking, it does offer plenty of bells and whistles, and the distortion and arpeggiator will endear it to the hard dance scene in particular. Phoscyon definitely offers a lot over the standard 303 clone, and at the price it's the most attractive proposition in the field. Acid-imitation aside, it's a fun synth with a mighty big sound that simply begs to be tweaked and then tweaked some more. It might not have an enormous amount of range, but it's great at what it does and is extremely reasonably priced. Definitely worth a fiddle.